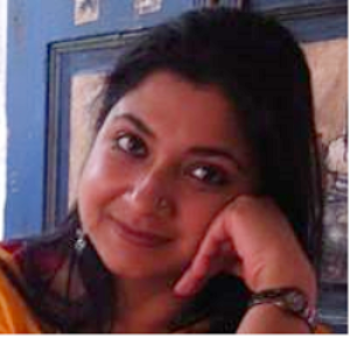 This month's featured scientist is Dr. Priyadarshini Dasgupta. 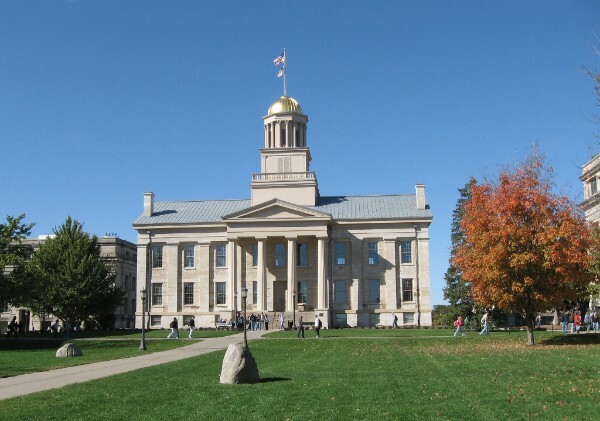 She will lead a coffee and conversation on Shaping up an academic career through your thesis on Tuesday, May 22nd at 3:00 pm EST/2:00 CST and be featured in an interview later this month in GWIS Lead. Look for details to sign up in next week's issue of GWIS Empower. We are pleased to announce the 2018 slate of candidates! Please follow the link below for brief biographies on each candidate. about Skills for Diverse Careers in Science, a poster session, banquet dinner, and our keynote speaker Dr. Corrie Moreau, Director of Integrative Research and Associate Curator at the Field Museum of Natural History and Professor at the University of Chicago. Want to share your science in our poster session Saturday afternoon? We want to see it! Submit your abstract before June 1st! The poster session is open to all, and there will be a competition open to undergraduates, graduate students, and postdocs. 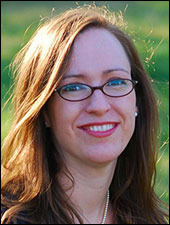 Dr. Laura Micheletti Puaca is an As sociate Professor at Christopher Newport University in Virginia, Director of Women’s and Gender Studies, and founder and director of the Hampton Roads Oral History Project. She is the author the award winning Searching for Scientific Womanpower, Technocratic Feminism and the Politics of National Security, 1940-1980 delves into the importance of Women in Science groups during WWII, when men left in droves to fight the war, leaving the women to carry on scientific progress. Dr. Michelle Booze interviewed Dr. Laura Micheletti Puaca. Look for the interview later this month in GWIS Empower. 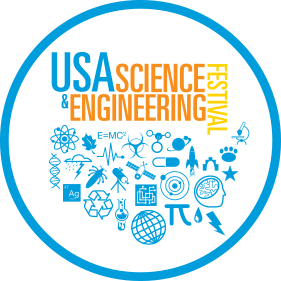 GWIS continued its tradition of sponsoring a hands-on STEM demo at “the nation’s largest celebration of STEM,” the bi-annual USA Science & Engineering Festival in Washington, DC, on April 6-8th, 2018. Our interactive exhibit on DNA shape, “Fun Models for Understanding DNA Structure,” introduced the 3-dimensional helical structure of DNA using a colorful, 2-foot high table-top model of a DNA molecule. Students, and sometimes their parents and other table visitors, then selected constructing either a DNA origami or DNA bracelet model, both illustrating the helical shape of DNA as well as being instructional regarding the base pair coding within the DNA molecule. Some youngsters even completed both demos when we were not too crowded. Part of the selection of this topic was related to the story of Rosalind Franklin, and thus the connection to “women in science.” Although we had a small table-top poster on Rosalind Franklin and her contributions to the discovery of the structure of DNA, we were most often too busy to include this in our presentations. I mention it, however, as a reminder for those who may use a similar demo with smaller groups. 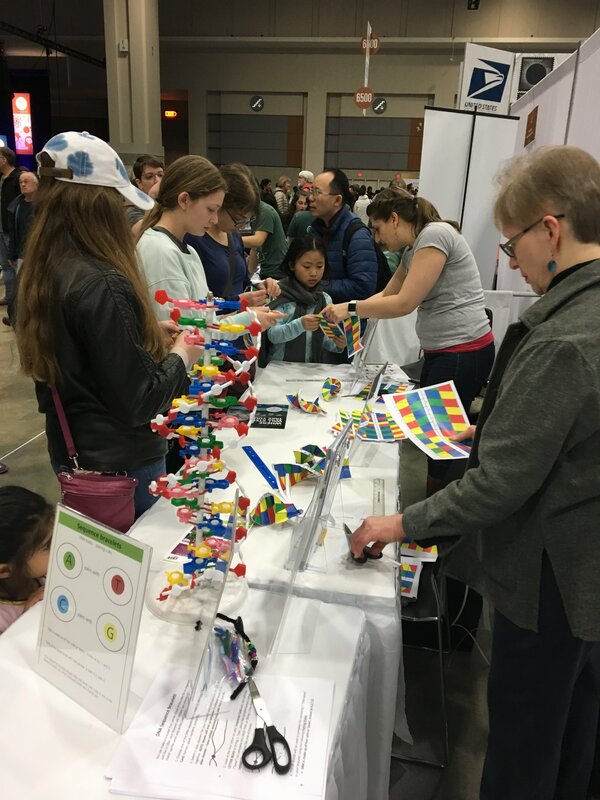 Over the 3 days of the Festival, we helped 2000+ students and other visitors construct DNA bracelets or DNA origami, while approximately several thousand more visitors just perused the demo. Students with accompanying parents and/or other adults were by far the largest group of participants, but many educators and other adults interested in STEM also visited the Festival and our demo. A number of STEM educators were interested in taking our demo back to their classrooms, and more than 100 were provided handouts of the demo instructions. We knew the colorful bead an d pipe cleaner DNA bracelets would be a hit with the kids, but some came to the demo specifically to participate in the DNA origami paper folding. 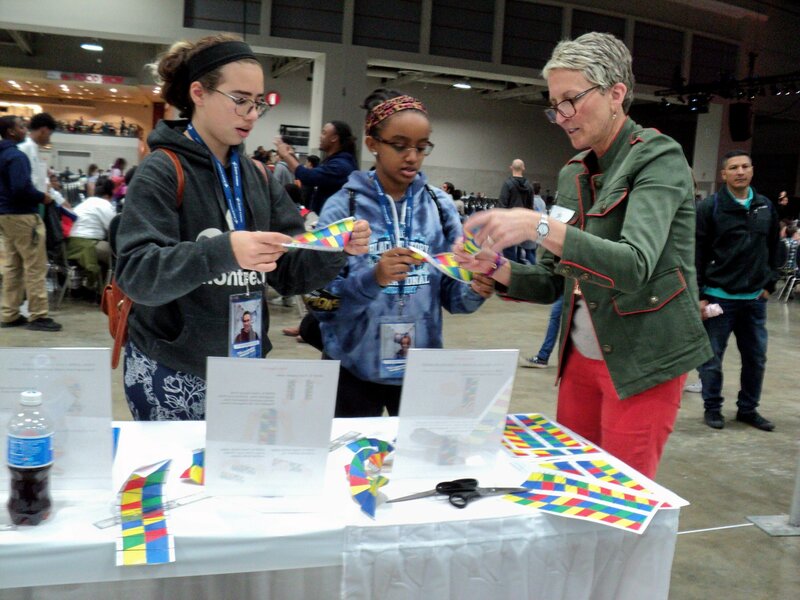 Although we initially thought the origami demo should be directed toward older students, we quickly became amazed at the many young and persistent participants who were quite successful in creating their 3-D origami DNA. A few parents were even enticed to participate. No matter their level of success, all kids left the demo with a DNA bracelet or DNA origami to take back to their classrooms. The success of this event was due to the efforts of many. First, GWIS support for the exhibitor space and some other costs was the key to our participation! The event would not have been possible without the additional support of Hood College and Frederick County Bank, both ongoing sponsors of the Greater Maryland Chapter. April Boulton, Dean of the Graduate School at Hood College, donated all of the printing, including the colored origami templates. The super sauce for our demo was the enthusiastic participation of 14 table hosts: 10 GWIS members from Greater Maryland, National Capital, Eastern North Carolina, and Penn State chapters, plus 4 not-yet-members, all working in very busy half-day shifts to support our demo visitors. Judy Staveley and Sherry Ward set up the demo on Friday morning, and Joy Beveridge and Sanya Whitaker helped transport supplies to the Festival. Susan Ensel and her students at Hood College packaged over 1500 small bags of beads for the DNA bracelets, and Susan bravely managed the demo alone for several hours on Saturday morning. Teresa Calzonetti and Jeanette Coffin assisted with transporting unused supplies back to Frederick, and Devora Wilkinson helped pack up the table at the end of the Festival. 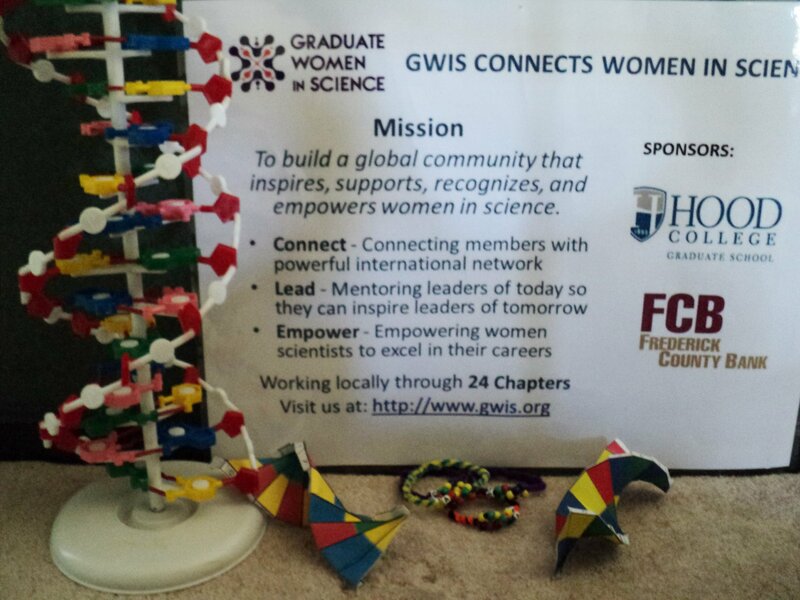 Other GWIS table hosts included Julie Ambarchian, Brianna Flonc, Megha Ghildiyal, Marion Greene, Jessica Hastie, Regina Royal, and Dana Yancey, each claiming table space in their particular area of bracelet or origami expertise. Marion and Brianna both traveled from outside the DC Metro area to participate. Thanks to all of these women in science for making this such a great STEM demo! And, an interesting 2018 article for the many science geeks among us indicates the study of DNA shape is a topic of continuing research interest: A unified approach for quantifying and interpreting DNA shape readout by transcription factors. 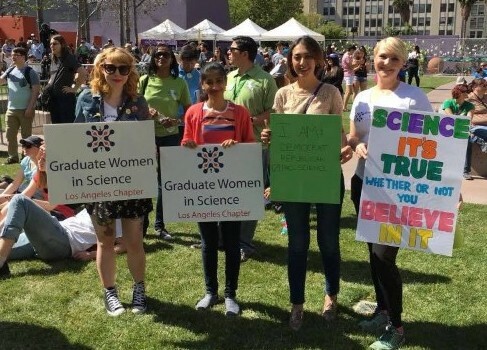 Read "A unified approach for quantifying and interpreting DNA shape readout by transcription factors"
Madison Chapter members got together for the March for Science 2018 to show their continuous support of STEM funding, education, access and support! The theme of the march was "Together, we can build a better world." Northern Colorado Chapter members and a troop of Girl Scouts explored the forensic sciences together. Through fun games and engaging discussions, participants got to learn about fingerprints, DNA extraction, microbiome, skeletons of multiple exotic animals. 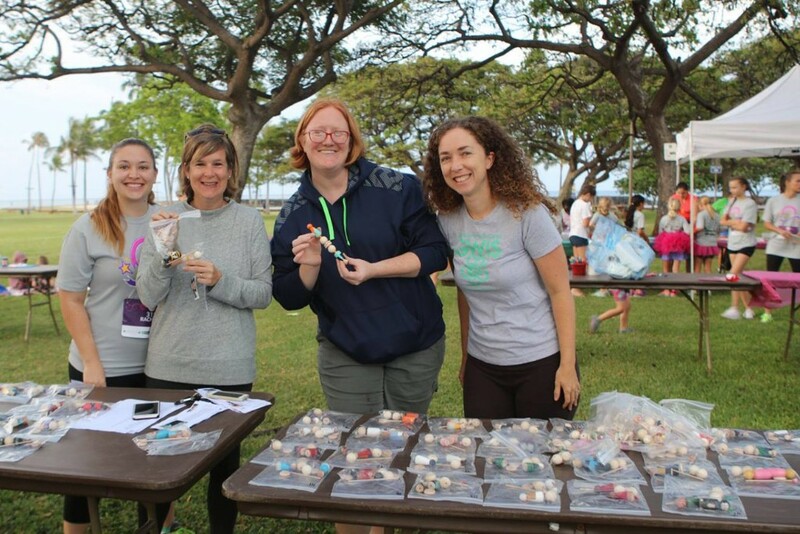 Hawaii Chapter members joined forces with Girls on the Run of Hawaii for a wonderful event last week. 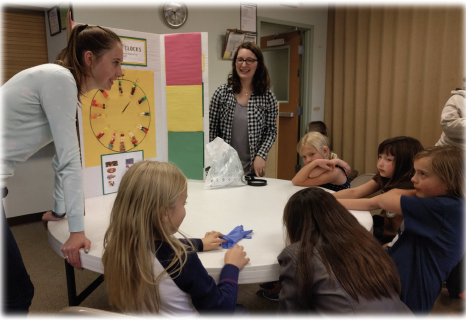 Girl Scouts explored the forensic sciences together. Race participants had the opportunity to make their own muscle massagers inspired by one of 150 women scientists. June 14th, 6:00-9:00 pm, GWIS Chicago Annual Fundraiser with Raffle Prizes and Silent Auctions. Goethe-Institut, 150 N. Michigan Ave, Chicago, IL. Contact chapter for more info and collaboration. May 23rd, 5:30-8:00 pm, High Heel Conversation Spring Series. Speakers will discuss problems and potentials for careers in the tech industry. Hosted by Chicago AnitaB. Registration is free. Visit the website for more info. May 6th, 2:00-6:00 pm, GWIS Fundraiser. Free for members and $15 for non-members. Contact the chapter or visit the Research Triangle chapter website. April 30th, 5:15-6:15 pm. CSU Environmental Learning Center Volunteer Event for 3-5th grade. Individuals are needed to lead an activity related to watershed/geology. Contact Abi Miller for more info and Rosie Duncan for carpooling. May 25th, GWIS Outreach Activity in collaboration with Girl Scout. To join or find out more contact Lyndsey Gray. May 4th, 3:00 pm. End-of-Year Celebration and Welcome of new GWIS Hawaii Officers. Kaimana Beach Park. Contact chapter for more info.